Swindon Plasterers M D Phelps are able to provide a huge variety of different services including plastering new walls / ceilings or re-skimming old walls / ceilings along with floor screeding , pebble dashing , lime plastering , floor and wall tiling, damp proofing and damp proof tanking installation , specialist polymer external renders in various colours and finishes , external sand and cement rendering , artexing , drylining , slurry dashing , and insulating walls along with many other plastering related services. If you have any enquiries please visit our contact page where you will find both our telephone details or an enquiry form which will be dealt with promptly. When your looking for Swindon plasterers look no furhter. 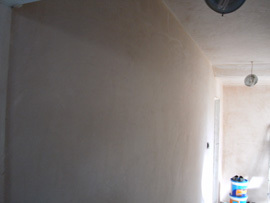 Offering standard plastering for walls, ceilings and arches as well as specialist Lime plastering (fully certifed). So if your looking for plasterers in swindon please call. Pebble dashing in various finishes Cantebury Spa, white spa , newbury flint and many other finishes and colours. So if your looking for pebble dashers in swindon please call. Offering floor screeding services as well as floor insulation prior to underfloor heating installation, so if you looking for floor screeders in swindon please call.. 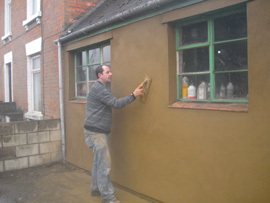 Sand /Cement rendering as well as specialist polymer renders in various finishes and colours. So if you need any rendering done in swindon please call. Artexing services with a huge variety of patterns available to choose from. So if your looking for artexers in swindon please call. whatever room in the home we are able to provide an excellent floor and wall tiling service with over 30 years experience behind us. So if your looking for ceramic tilers in swindon please call. Swindon Plasterers M D Phelps are fully certified to undertake specialist Lime Plastering services. All Damp proof tanking and damp proof course systems can be carried out by our fully certified tradesman. MD Phelps Plastering has been contracted by our company to carry out a number of projects, which have been completed to a very high standard & on schedule.